In power for more than 25 years, General Idriss Déby Itno is one of Africa's longest-serving leaders. At the 26th AU Summit in January 2016, African heads of state elected Déby to serve as chair of the African Union. He is also the chair of the G5 Sahel countries. During his long tenure in N’Djaména, Déby has survived a number of coup attempts, partly by building a formidable army, known as one of the most capable in Africa. His forces have intervened in the Central African Republic, confronted Al-Qaeda in the Islamic Maghreb in Mali and won significant battles against Boko Haram. West African and Western powers have praised Chad as indispensible in the fight against terrorism, but critics say this focus on military strength has come at the expense of development and human rights. Chad ranked 185 out of 188 countries on the 2015 Human Development Index. Déby was born in 1952, the son of a herder in Fada, in north-eastern Chad. A career military officer, he was instrumental in the coup that brought Hissène Habré to power in 1982. Seven years later he fled into exile after being accused of plotting to overthrow the government he helped put in place. In Sudan, he formed the Patriotic Salvation Movement. In 1990 his forces drove into Chad and deposed Habré; Déby was proclaimed president. His government introduced a constitution that established multi-party elections. 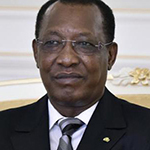 Déby won the country's first presidential election in 1996 and was re-elected in 2001. In 2005 he won a referendum that allowed him to seek a third term in office. He won re-election in 2006 and 2011 in elections that were boycotted by the opposition. He was re-elected for a fifth term in April 2016.